New WCT 1000 from Tactical WestCoasTime. 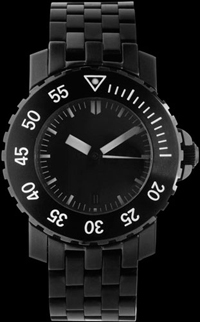 WestCoasTime watch brand has introduced a new version of the model WCT 1000m Diver - Watch WCT 1000 Tactical. New WCT 1000 Tactical, made in military style, was made in Germany. The black dial features white hour markers, large white arrows, made in the form of bars. Hour-markers and hands are covered with luminescent SupeLuminova. Small date aperture is placed in the “6:00”. Sapphire crystal protects the dial of a 5 mm thick with anti-reflective coating on the inside. New Diver model WCT 1000 Tactical features a helium valve and a water resistant to 1000 meters. Hours are collected on the basis of the Swiss automatic ETA caliber 2824, which protects from the effects of electromagnetic waves up to 80 000 A / m. The model comes on the bracelet, the material and color is fully consistent with the material body. Buy a watch brand from 1000 Tactical WestCoasTime possible for 1295 dollars.